When I was a child I spent hours tinkering with my Meccano collection. I had just one box but could make so many things. I wasn't sure my utterly modern-day, screen-keen children would love it as much as I did however. I couldn't have been more wrong. As soon as my children spotted the Spinmaster Meccano Model Motorcycles set from the Engineering and Robotics range they were fighting about who would get to have first go at it. 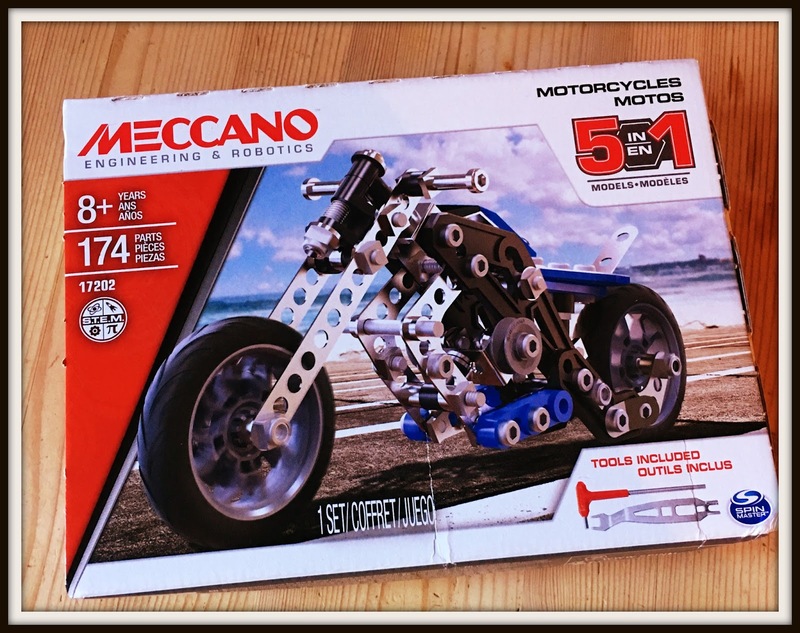 The box contains 174 pieces of metal Meccano and tools and comprehensive instructions on how to make 3 different motorcycle models. There are five 'bikes in total pictured on the box for you to use as a guide to make using the kit and of course you can just do your own thing and use the parts to make whatever you like but my children aged 10 and 12 started with one of the suggested models and followed the enclosed instructions. If nothing else the kit gave them taste of adult life when you bring home that piece of furniture and bags of fittings. I got them a little tray and showed them how to sort the pieces into piles and check them against the contents list included in the kit. All parts were present and correct along with a few extras which came in handy when the cat walked over the workspace scattering tiny washers and bolts. My son and daughter worked together making the model at first but it was actually my daughter (aged 10) who stuck with it until it was finished with occasional help from older siblings or passing parents. I would say adult supervision would be a good idea for younger model-makers who might get frustrated at the fiddly bits or need a bit of help with interpreting the instructions. On the whole my two did manage on their own though. 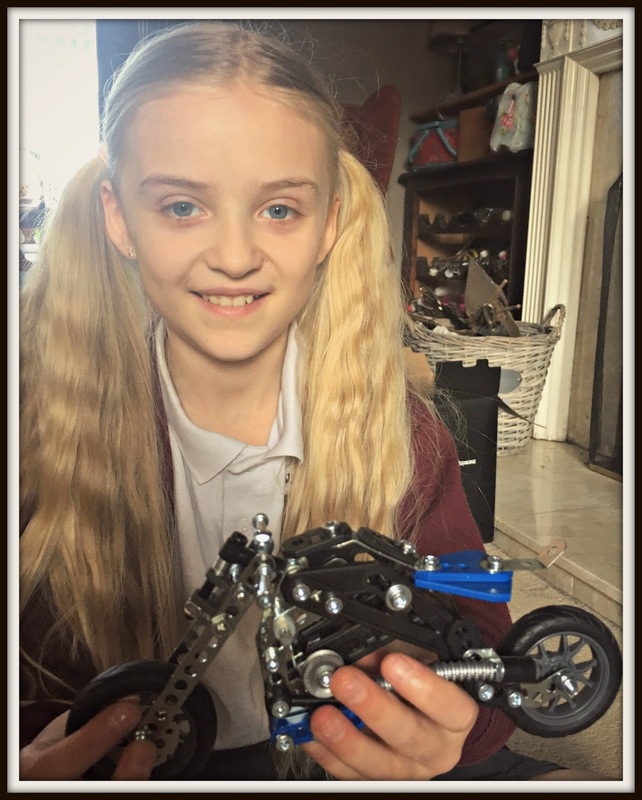 It proved the perfect activity to pass a rainy Sunday and the only issue now is she is so proud of the motorcycle she made she can't bear to disassemble it so she or someone else can have a go at a different model! My 21 year old motorbike fan also fancies having a go at it and I can see him getting hooked and moving onto more complex kits including the motorised range. The motorbike kit we tried is aimed at ages 8 and upwards but there really is Meccano for almost all ages from the colourful Meccano junior range for age 5 years and up up to the Meccanoid G15 which has just won the Innovative toy of the year Gold award and the spectacular 4 ft tall Meccanoid robot with voice recognition and ten motors which I reckon any adult would be proud to show off. Back to the Meccano Motorcycles kit. I think the toy has longevity - it will come out again and again and is the sort of toy I would never throw away because it is durable, timeless and not gender specific. Hopefully one day I will have grandchildren who will sit at my kitchen table and play with it if my son doesn't sneak it away to uni to pass some time between studying and sleeping. I was very impressed with the information on the box which informed me that this and all Meccano Maker sets are designed to encourage STEM learning - science, technology, engineering and maths and supports the teaching of those subjects in the National Curriculum. Fun and educational- every parent's dream come true. Disclaimer: I received a Spinmaster Meccano 5 in 1 Model Motorcycles set worth £12.99 free for the purpose of writing this honest review.